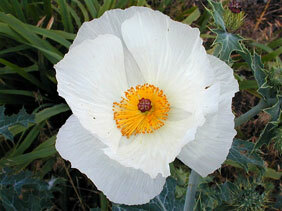 Also Called: White prickly poppy. Stems: Erect, stout, mostly solitary, unbranched or branched above, bluish green, waxy, sparingly prickly, contain yellowish orange sap. Leaves: Alternate, fleshy, bluish green, waxy, mostly glabrous above, prickles on veins below; lower leaves stalked, oblanceolate, 3 to 10 inches long, 1 to 4 inches wide, deeply pinnately lobed; upper leaves sessile or clasping, elliptic, oblong or ovate, reduced in size, only shallowly lobed; margins wavy, spiny-toothed. Inflorescences: 1- or few-flowered clusters, near top of stem. Flowers: Showy, 2 to 4 inches wide; sepals 3, widely elliptic, waxy, prickly; petals 6, large, white, thin, wrinkled; stamens numerous, yellow, in spherical arrangement; stigma 3-5 lobed. Fruits: Capsules, elliptic, 1 to 1.5 inches long, about .5 inch wide, covered with stout yellow spines; seeds numerous, small, shiny, dark brown. Habitat: Prairies, waste areas, pastures, flood plains, disturbed areas, and roadsides, most abundant in sandy soils. Uses: Native Americans used the bright yellow sap to remove warts and to dye arrow shafts; used the crushed seeds to treat burns, cuts, and sores; and boiled the plant and applied the resulting liquid to sunburns. Comments: An abundance of prickly poppy can indicate overgrazing.